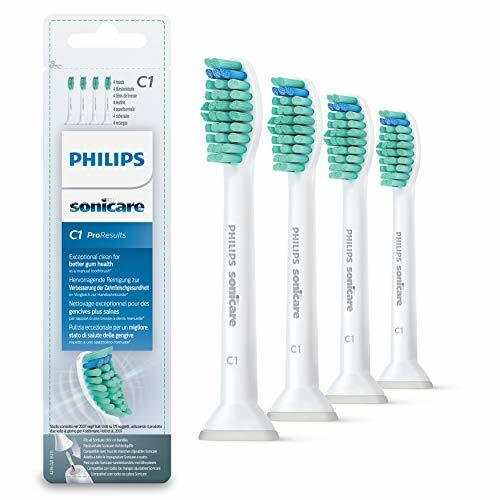 On this page we’ve tried to cover everything you could want to know about Philips Sonicare Toothbrush Heads – where to buy them, which one’s best, how they work, and more. If there’s anything more you need to know, please ask in the comments. Browse the page as normal, or use this list of navigation links to jump to different sections of the article. For more advice on brush heads – like how to get them cheap and when to replace them – see our brush heads buying guide and faq. All of the brush heads offer slightly different things, engineered slightly differently, to suit different users’ needs and desires. As a result it is not that simple to say definitively which is ‘the best’. However, we know people like simple answers, so we have done our best to break things down a bit. Have a read over the sections below to see which brush head appeals to you the most. And be sure to check out the rest of this article if you need any more information – we’ve covered as much as possible, but if you’ve got any questions, ask in the comments. Although it is difficult to say definitively which Sonicare brush head is the best, there is the ProResults (view on Amazon) brush head which is an excellent solution for most users offering superior every day, all round cleaning. If you own one of the newer BrushSync (more on that below) compatible brushes, the C3 Premium Plaque Defence (view on Amazon) is the best all-rounder, in our opinion. We’ve also created our own comparison & compatibility chart to help with this, and listed all the brush heads available to buy here. For some brushing teeth can be a more difficult experience than for others, particularly if you suffer from sensitive gums and teeth. Whether this is something you have always suffered from or whether as a result of surgery or infection, then there are options which can ease the process of cleaning your teeth with a Sonicare electric brush, but still bring many of the benefits. In this instance you will require the Sonicare Sensitive Standard sonic toothbrush head (view on Amazon). The bristles are some 25% softer than most other brush heads and the bristles are trimmed in such as way that the experience on the teeth and gums should be softer and more enjoyable for those with sensitive teeth and gums. For maximum effect, use the Sensitive brush head with the sensitive cleaning mode available on many Sonicare models. If you own a BrushSync compatible brush, consider going for the G2 Optimal Gum Care brush head (view on Amazon). It is possible that you can use any of the Sonicare brush heads with the sensitive cleaning mode on Sonicare brush handles but the clean and experience may not be as enjoyable if you suffer from sensitive gums. When you first wear braces you will likely be told the importance of cleaning effectively around braces to avoid staining of when it comes to removal. The natures of braces offers up lots of areas for small food particles to stick to. It is easy to think that you need specialist brushes and they do exist. However with a Sonicare electric toothbrush you can use any of the brush heads safely with braces, you do not need a special brush head. With that in mind, you may as well go for our ‘best all-rounder’ recommendations, the ProResults, and get the best value for money. Competing brand Oral-B do recommend an Ortho brush head, but even your favourite Sonicare brush head will work effectively at cleaning away plaque and food debris if you should have braces. Having shiny white teeth can be a real confidence boost and there are few nicer compliments that ‘you have a lovely smile’ or ‘your teeth look great’ and what if you can achieve this without having to undergo cosmetic dentistry. This is to a large degree possible. Just select a brush head, cleaning mode and toothpaste optimised for whitening and away you go. The best brush head to use from the range is the DiamondClean head (view on Amazon), be that the Compact or Standard sized option. The tightly compacted diamond shaped bristles create a stain-removal pad and offers a superior clean and can make teeth appear whiter in just one week, through effective cleaning and stain removal. If you have a BrushSync compatible handle consider opting for the W3 Premium White brush (view on Amazon) head. If you have a Whitening mode, the handle will automatically select that (subject to model) so that you can take advantage of the specially programmed pulsations and brush strokes. For more impressive results you can assist the Sonicare electric toothbrush by applying a whitening toothpaste such as AP24 from NuSkin or Oral-B 3d White Luxe Perfection which have been specifically designed to assist in stain removal for whiter teeth. The decision is ultimately yours, and depends on what you need. Based on the information provided in this article, hopefully you can make a decision that best reflects your needs and desires. As a Sonicare brush, all heads offer a sweeping motion like a manual brush and not the oscillating and rotating motion that competing brand Oral-B do. All brush heads will help to remove more plaque than a manual toothbrush whilst improving gum health and your overall oral hygiene. Each of these have potential advantages based on your specific needs. Click a brush head type in the list below to jump to a detailed explanation of how it works, a list of places to buy, and a list of brushes it’s compatible with. C2 Optimal Plaque Defence – Optimal plaque removal, 7 times more effective than a manual brush the specially curved power tip makes reaching the teeth at the back of your mouth a breeze. BrushSync compatible. G2 Optimal Gum Care – Gentle, yet effective plaque removal, particularly along the gumline to improve gum health. BrushSync compatible. Do not be worried that you need to use them all to target different areas of the mouth. You can still have white teeth, healthy gums and reduced plaque by using the DiamondClean head. Using the Sensitive brush head may improve your experience but will not mean that your teeth are more stained because it does not aggravate the tooth surface as much. Cleaning your teeth properly twice a day for 2 minutes each time is the most important part here. Our full guide explains how to brush your teeth with an electric toothbrush as a poor teeth cleaning approach is more damaging than the incorrect brush head. The reality is each brush head can just give that extra bit of focus in achieving and assisting oral health care goals. 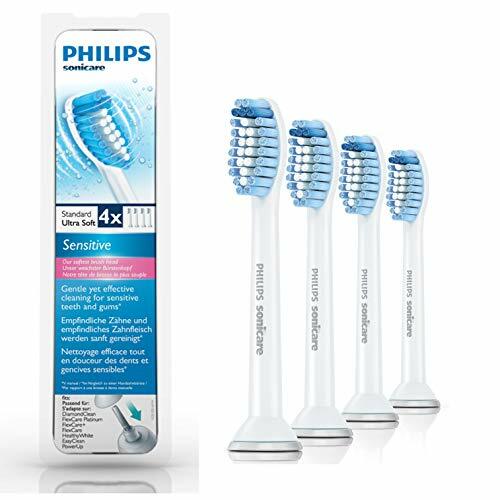 Different brush head styles, in different sizes with a differing number of brush heads in the pack; it is extremely easy to become overwhelmed by all the different Philips Sonicare toothbrush heads. We do hope that this page, complete with detailed explanations and brush head comparisons, will answer many of your questions and help you find the right brush head for you and your Sonicare brush. So let’s jump straight in. There is also the Kids range, but more on that later. If the names do not make it clear, the standard is a brush head similarly sized to a brush head you may see or use if you have a manual brush. These are great for covering a larger surface area, but can be more difficult or not ideal for all users. This is where the compact brush heads come in. Smaller in size, they cover less tooth surface area when in the mouth, but they are easier to move and manipulate in tighter spaces or harder to reach areas such as the back teeth. The compact design also makes for a more comparable offering to Oral-B’s brush head design that typically is smaller than that of Philips Sonicare brushes. The technology and motion is still slightly different in how each head moves and cleans the tooth surface, but both still do an excellent job. Brush head design style considered, you then need to think about the size of the brush head packs. This is how many brush heads are included when you buy them. Pack sizes normally start with a minimum of 2 brush heads per pack and then most commonly 4 brush heads per pack with 6 and 8 per pack also available. Typically the 6 or 8 heads per pack are available in select ranges and with this, the cost per brush head normally reduces. The downside is that these larger pack sizes are too normally reserved for the standard sized brush heads and not the compact ones. It can easily be argued that each brush head within the Sonicare range is specialist, in that they are each designed to do something specific. However, the following are even more specialist. Technically, these are not brush heads, they are nozzles. Philips produce the AirFloss and AirFloss Pro; a dental flosser, that fires jets of water into the mouth at pressure. The water is delivered via the slim angled nozzle and guidance tip which makes finding the correct placement easy. Designed for interdental cleaning this is another type of product, but I wanted to mention these within this article as the nozzles used are replaceable and can be classed as a head for the flosser. They come as either a 3 pack in a green colour or a 2 pack in pink. The newest innovation in electric toothbrush technology from Sonicare is the introduction of BrushSync. This is a technology that offers communication between the brush handle and brush head. The technology comprises of 2 different functions. The brush head replacement reminder tells you, via an LED on the brush handle when it is time to change or replace your brush head. If you were to buy and fit the C2 Optimal Plaque Defence brush head to the handle, it would pair with the ‘Clean’ mode whilst the G2 Optimal Gum Care brush head will pair with the Gum Care mode. It is perfectly possible to use a non-BrushSync compatible head on a BrushSync enabled handle, but you will not enjoy the benefits it brings, and the BrushSync heads were more expensive at the time of writing. This is the same if you use one of the BrushSync heads listed on a handle that does not support BrushSync. Although we have covered everything you need to know above, we have also created a separate article explaining BrushSync. 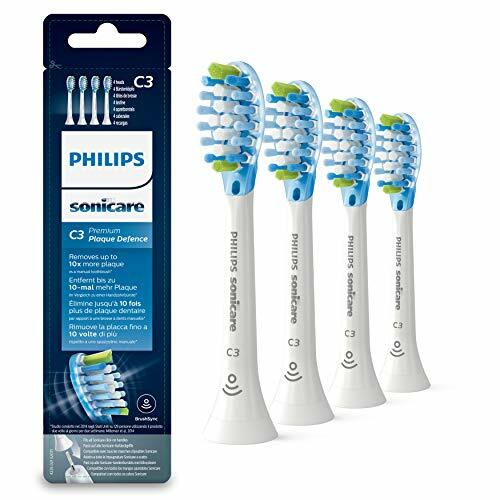 Despite a Philips Sonicare electric toothbrush coming supplied with one or more styles of brush head in the box, the best news is that the brush heads are fully interchangeable. This means that all of the brush heads offered by Sonicare work with almost all of the electric toothbrushes. There are a few odd exceptions, notably older Sonicare toothbrush models that have different attachments, screw on rather than click on. So, whether you have a Sonicare DiamondClean or ProtectiveClean model you can use any of the previously mentioned brush heads. One of the biggest benefits of this design and interchangeable nature is that it allows you to take advantage of the different benefits both brush handle and head bring. If your oral hygiene goal is whiter teeth, you can select a brush handle and appropriate brush head that help achieve this goal. It also accommodates the needs of families where a brush handle may well be shared amongst different users. Now for a little more detail on each of the the different brush head types. Click here to view buying options for the DiamondClean brush head. Click here to view buying options for the AdaptiveClean brush head. Click here to view buying options for the Intercare brush head. Click here to view buying options for the ProResults brush head. Click here to view buying options for the Sensitive brush head. A brighter and Whiter teeth often give you the extra confidence to smile. The Sonicare Optimal White brush head is specially designed to remove up to 100% more stains for whiter teeth in just 7 days. Click here to view buying options for the W2 Optimal White brush head. However, with this brush head, the reminder may will be electronic (subject ot brush handle) thanks to the BrushSync technology built in. It is possible to use the W2 Optimal White head on the following models, but the ‘Smart’ feature of the brush head WILL NOT work. Click here to view buying options for the G2 Optimal Gum Care brush head. Click here to view buying options for the C2 Optimal Plaque Defence brush head. Perfectly suited for those wishing to ensure optimum plaque removal as part of their daily brushing routine, the C2 brush head does also boast a specially designed curvature to the tip of the brush head, that helps reach the very back teeth. It is possible to use the C2 Optimal Plaque Defence head on the following models, but the ‘Smart’ feature of the brush head WILL NOT work. Click here to view buying options for the W3 Premium White brush head. It is possible to use the W3 Premium White head on the following models, but the ‘Smart’ feature of the brush head WILL NOT work. 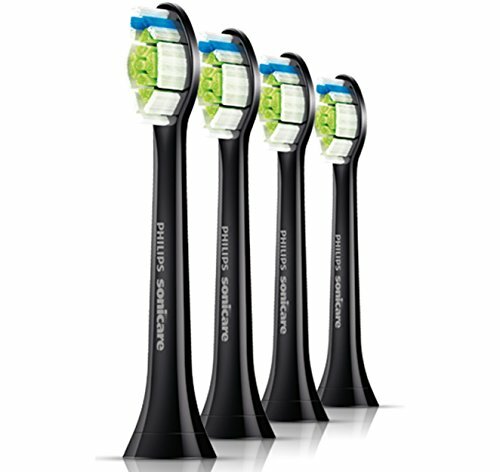 Click here to view buying options for the C3 Premium Gum Care brush head. Click here to view buying options for the C3 Premium Plaque Defence brush head. Flexible sides complement the unique bristle pattern design to remove up to 10 times more plaque, even in the hard to reach areas. Cleaning thoroughly in between teeth and along the gumline, the soft rubbers sides of the Plaque Defence brush head adapt to the contours of your mouth. It is possible to use the C3 Premium Plaque Defence head on the following models, but the ‘Smart’ feature of the brush head WILL NOT work. Which cleaning modes do Sonicare brushes have? Of the various different models currently available from Philips, the number of cleaning modes available differs from model to model. Depending on which Sonicare electric toothbrush you have or considering will mean different cleaning modes. The only mode all brushes have is the ‘Clean’ mode. We explain these is more detail in our post on Sonicare cleaning modes. Each style of brush head and pack contents has a different model number that Philips Sonicare use internally to differentiate their different products. So there we have it, that is all we know about Sonicare brush heads. We hope this has helped. If you have any questions, let us know in the comments below. Specifically designed for children these heads work with a more select range of brush handles and are not designed to be used with the wider variety like most other are. With a contoured profile to fit your child’s teeth, the standard sized heads are most suited to children aged 7+whilst the smaller compact option are best suited to kids aged 4+. Soft bristles for a gentle cleaning experience helps encourage children to brush for longer and assists in education of the importance of regular cleaning. Featuring a rubber moulding on the back of the brush head for safer, more pleasant cleaning. Both will help remove more plaque than a manual toothbrush, but the larger brush head used by children aged 7+ can remove as much as 7 times more. What might appear to be a perfectly acceptable and usable brush head can be doing more damage than you may think. It is vitally important that the brush head on your Sonicare toothbrush is replaced every 3 months. This is a general consensus among the dentistry profession. A new brush head should last on average 3 months, but for some users you may need to replace the brush head sooner. As a head is used, the bristles become worn, they can fray and become softer and less effective. When new bristles are normally quite tightly formed in a group together but over weeks of use will gradually start to part. It is at this stage that the brush heads lose their effectiveness and could be doing more damage to the tooth surfaces and your gums. Reminder bristles will act to encourage you to replace them when necessary if you do not mark the replacement date in your diary or subscribe to services that deliver new heads every 3 months to you. For those using a BrushSync compatible handle and brush head, the Amber BrushSync LED will illuminate to alert you when a replacement head is required. Particular bristles on the head will start out blue and will over a 3 month period fade to become white. How do you replace the heads on the Sonicare brushes? In two simple stages. Why can’t I find a round brush head for my Sonicare toothbrush? Sonicare and Oral-B use different technology for their brush heads, and Sonicare does not make round brush heads in the same style as Oral-B. If my info serves me correctly, all of these listed here will fit. You have a Sonicare DiamondClean brush handle. If you need more assistance, let me know. I have a DiamondClean HX9393/93. It is OK, but it sprays water from the mouth all around. Hi. When you say it spays water, you mean out of your mouth? If so, perhaps bringing the lips closed together to create less of a gap for water to escape. A very different subject: My now-deceased husband and I have used Soncicare Electric toothbrush probably since they were initially on the market—he died in ’99 and we were using multiple brush heads with a single handle. But our brush heads screw on, not click. I’m now on the second brush handle after several decades and it, too, has a screw-on brush head; a family member just brought home a package from Target, and I could not tell until I opened it that it is not the correct type. How do I purchase the screw-on type that I need for my Sonicare brush handle? If you click here, you should see the screw on style brush heads. I think these are what you are after. I agree with A Stephenson,; excellent article. Can you tell me how to mark my toothbrush head and my husbands to differentiate them, please? My last Oral B toothbrushes (nothing like as good as the Sonicare) had the advantage of coloured rings but I can find no way of identifying mine from his, except by marker pens, which rub off!!! Well assuming you are using the same style brush head as your husband, then sadly, to my knowledge there is no easy solution when using the official brush heads. Your idea of a marker pen is good, but if they rub off not great. Some have opted to put stickers on neck of their brush heads, but I know of not ‘better’ solution. Whilst I do not endorse 3rd party brush heads as the best, there are some very good options. Our article on aftermarket brush heads looks at some options. There are the these heads available on Amazon, for Sonicare, but have the coloured rings like Oral-B. I have some of these myself and I would struggle to fault them really for the quality of their overall clean and performance for the price. At the time of writing they are more expensive. I believe I paid around £12ish. That’s helpful, but rather short sighted of Philips! Try a spot of nail polish at the very base of the tooth brush head. Works for us. What about the rubber, interdental “brush”. How is it used, it came with my kit, but I’m not sure what to do with it. Can you give a little more information on the interdental brush you are referring to. What did it come with? Which kit are you referring to? Yes, after looking closer, its not rubber, it has a small, pointed bristle head. It came with my SonicFX base, and set of brushes. I think they are called “interdental” brushes on their reorder web page. This page has all the brush heads available for Philips Sonicare electric toothbrushes, but the brush head you speak of has been supplied by a different brand/toothbrush, made by SonicFX. I know what type of brush head you now mean as many of the far eastern branded toothbrushes come with these. The idea is you use it in a similar way that you would an interdental brush such as those made by Tepe if you have ever used one of them. You place it in-between the teeth to help clean interdental spaces. It depends how helpful you find it, but I have typically found floss or proper interdental brushes to be more effective. Here are some pages that might be useful to you. Excellent article. Vastly more useful than Philips’ incompetent, opaque website.